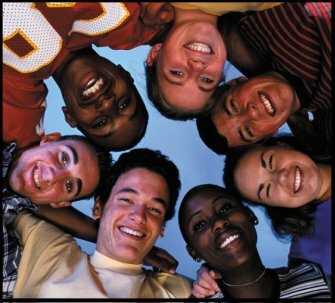 There is often a lot of negative press about teens, especially teens in group settings. I have to admit – with some shame – that I have come to believe those pictures the media paints. You know what they portray…loud, obnoxious, destructive, disrespectful, etc. Here’s the reality. The doors opened to the exhibitors booths at 12:30 pm on both days for the conference, and by 12:35 we were already experiencing a line-up. By 1:30, the assigned security to our booth had to maintain a line of kids waiting to come in to make their purchases. And while all that was happening, the cash registers never stopped…we had a line-up until 10 minutes after the doors were closed. And what behaviour did we witness? While in line, the kids were straightening the product piles, talking with each other, politely waiting, and generally understanding that we were keeping up as well as we could. We even were routinely asked where we wanted them to place their backpacks while they were shopping. (I guess that’s an adult stereotype – we don’t trust young people in groups). I have been at great youth events before, and interacted with amazing kids in those gatherings – but that was through conversation, and have had the privilege of worshipping with them. It’s really a powerful thing, to watch that many teens with deep and real questions, worshipping a God who is very real to them. It always raises my spirits and let’s me see that the Church will continue to be a vibrant place where God is known and welcome, and where the Gospel of Christ will be taught – but to watch that many kids be, without exception, polite and honouring of each other was, well, quite happily unexpected. It shows that the leaders who are pouring into their lives, and the parents who are doing their best to raise decent members of society are doing their jobs well. It was awesome to have one of the security guards, during a rare slow point, ask what this weekend was all about. After I explained it to her, she said – “I knew there was something different about these kids, I’ve never been to anything like this before”. I had to smile – the Body of Christ, gathered there, had just shown Him to this young lady. And I couldn’t have been happier to be wrong about a preconceived notion. The Church will be in very good hands with this generation!